I like the back too – you can see the quilting better. It disappears on the front. The quilt was made almost entirely from scraps. I purchased only the solid (Kona Azure) for the random aqua blocks and the binding. All the other fabric came from my scrap bins. Each block is 3 1/2″ square and the finished quilt is 60″ x 72″. The backing was an old Ralph Lauren sheet I had purchased years ago and never used. It’s twin was used for the back of M’s Christmas quilt. Start date: 2/24/12; finish date 3/31/12. I also completed 4 blocks for the Faith Circle of do. Good Stitches bee. Des asked for 4 butterfly blocks (using this tutorial) in fresh, pretty girl colors. After I took this picture, I measured and they were just a bit shy of 6 1/2″ so I had to take them apart and re-stitch the middle. I admit I’m struggling with a 1/4″ seam on my new machine. I have to move the needle quite far to the right to get the seam allowance more accurate. I worked on another block for the MMQG bee where I had seam allowance issues. That block is “Missing your kiss” from the Modern Blocks book. I had to completely disassemble it and that’s as far as I got. One block of the 9 patch is just a bit smaller than 4″ square so I hope I can get more fabric to remake it. Grrr. Finally, I took a leap and free motion quilted my first quilt. This is also one of the earliest quilt tops I made and it’s my own creation. Nothing fancy about it. It’s going to Quilts for Kids as soon as I bind it. The fabric is primarily Santorini by Lila Tueller. Its a lovely quilt. What a great use of your quilts. You are speed rolling yourself through your quilts! I cannot believe you have done 3 in 3 months. That is an effort! i like your scrappy quilt. It’s so happy! A wonderfully productive month! Your FMQing looks great! I’ve only done it twice with so-so results. I read on Leah Day’s website to try it with the feed dogs up instead of down so I’m going to try that on a little baby quilt I’ve been slowly working on. My machine has tension issues I just have not been able to resolve so I’m hoping the feed dogs up will be the trick. Thanks Debbie! My old machine wouldn’t FMQ either – it kept on throwing clumps of thread on the back. I just discovered Leah Day’s website. I’m intrigued about keeping the feed dogs up – I know we put them down to avoid drag, and with just a baby quilt my shoulders were really stiff afterwards. I’m interested to find out why she does that. Wow! You’re rolling along! Your fmq is great. That’s such a cheerful quilt! 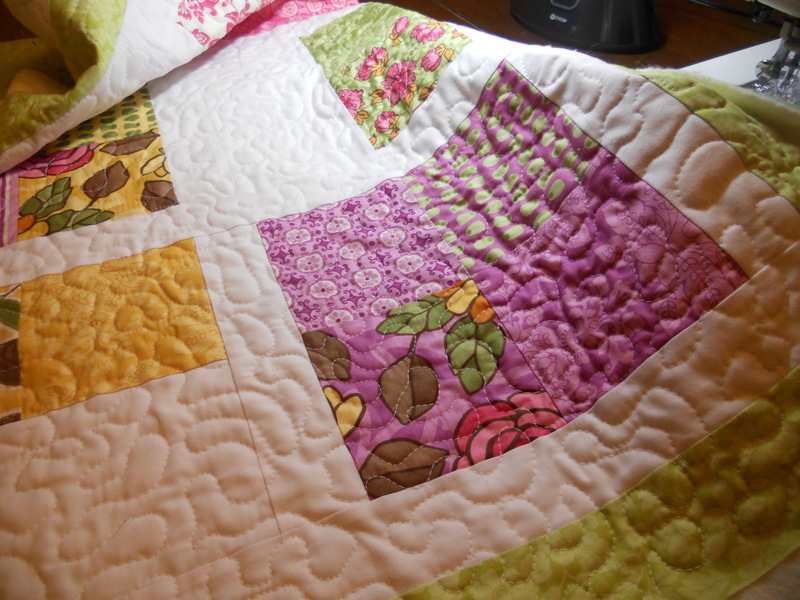 Wow Linda, that scrappy quilt turned out so beautifully! I love it. And your FMQ looks great, you are a natural. Thank you Rebecca! I’m glad I finally took the plunge. My shoulders were sooo sore after. I can’t imagine doing a really big quilt like that. Thanks Lee! I’m sorry I didn’t make the dinner – I missed you guys too. I actually took advantage of the fact that all my boys were out of the house and got some sewing done!